Monumental 26" wood fired wild clay blend tear drop vessel by Josh Copus. 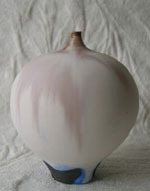 The vessel is wheel thrown and paddle shaped with coarse brush decoration. Wild clay is non industry processed clay that Josh harvests locally. In excellent condition. Josh's work is in the permanent collection of the Mint Museum. 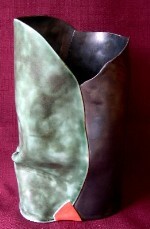 Handbuilt 8" contemporary porcelain vase by Maine potter Monique Bousquet. Often called a contemporary George Ohr, Bousquet has worked in Limoges porcelain for 16 years, exhibiting in Europe before returning to her native Maine. In excellent condition. Beautiful 3" dusky tan and mauve Cabat "Feelie" with blue accents. Noted potter Rose Cabat had her 90th birthday this summer. She is still actively potting in Tucson, Arizona. Minor flea bite on the bottom. In otherwise excellent condition. 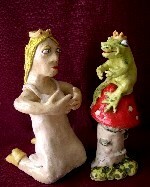 Charming "fairy tale" sculpture by popular folk artist Stacy Lambert. This exceptional 7.5" "Princess and the Frog" sculpture is signed number one and dated August of 2007. In excellent condition. 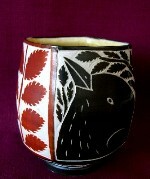 Sold - Wonderfully executed 4" folk inspired sgraffito porcelain teabowl by Matthew Metz. Metz's pottery has been exhibited at galleries nationally and in Japan and can be found in the Minneapolis Institute of Arts and Archie Bray permanent collections. In excellent condition.